This review may or may not have spoilers. Recommended to: People who want to read about an idiot with a temper. I seem to be turning into a hater-reader lately. Nothing seems good enough these days *sigh*. This book had a lot of issues. Mack (the MC) was dumb. There is no other way to describe her. All that rage and no brain cells. What a sad existence! The evidence pointing that she was not human was practically shouting I AM HERE but Mack couldn't see it. She believed she was human till 90% of the book. > Mack lives with shifters. > She is convinced that she is human. > Her human mother put geas on shifters that prevents them from revealing her identity. > Alpha can communicate with her through pack link even though she is a human. > She is a better fighter than shifters. > The one that drove the nail in; she has bloodfire in her veins that makes her strong. > Still Mack NEVER doubts that she can be any thing other then a human. Role of Corrigan, the supposed hero, was practically non-existent. He has a total of 7-8 scenes in the book including the last one where he saves the day. I don't know why it is listed as Paranormal Romance because it was NOT . 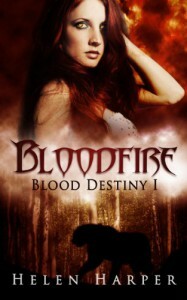 I didn't like Bloodfire and that's that!